Secure Login Client (SLC), part of SAP Single Sign-On, automatically launches when the macOS boots. That is often the desired behavior, but in my case, it wasn’t. So I wanted to share with you a simple way of preventing SLC from launching at boot time. I have two user accounts on my iMac, a personal and a work account. I don’t need SLC for my personal account and thus didn’t want macOS from launching it for all logged in users. 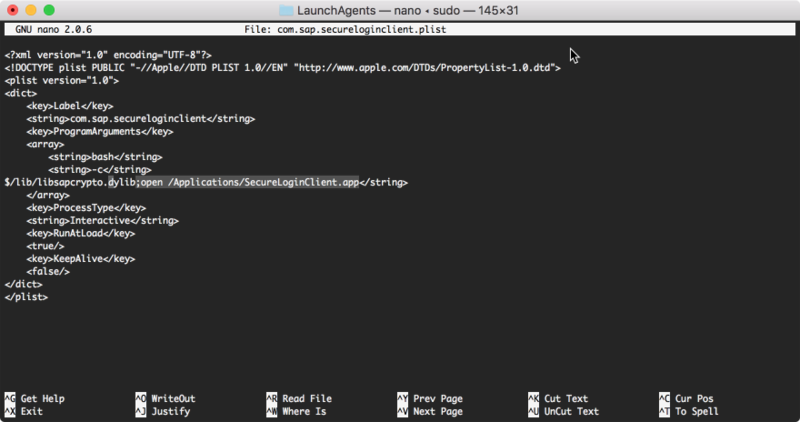 To prevent SLC from launching at boot, open the Terminal.app and navigate to /Library/LaunchAgents. Sudo will prompt you to enter your account password. Then press CTRL + X and Y to save and exit nano. Next time to restart your Mac, SLC will not start automatically. You may have to repeat the above steps after upgrading SLC to a new version because the installer is likely to overwrite the changes you have made.